I finally understand for a woman it ain't easy tryin to raise a man. 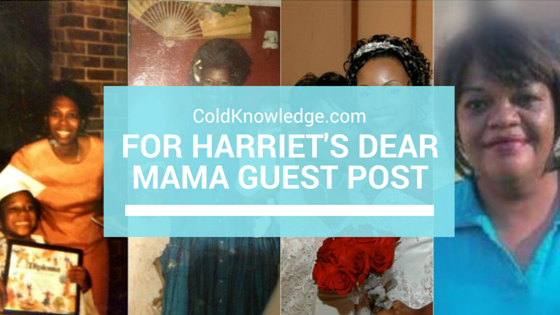 So this past Mother's Day I had the highest honor of submitting some kind words about my mother on ForHarriet.com. Most know that I'm a fairly private person when it comes to things such as my family, so stepping out of my shell for this one means a lot to me. I don't always share my views on my parents, or parenting in general, so to share some words about my mother for this piece is new territory in terms of my writing. This amazing piece was put together by the wonderful Ashley Cobb of Dope Black Chick. You can find her on twitter at @DearAshleyCobb. I hope I did her justice in while having the spotlight for this occasion. You can be the judge of it by clicking the following link: Dear Mama: Black Women Share Letters of Thanks for Their Mothers. Hope all of the mothers out there had a great Mother's Day with the families and friends.